Borley Rectory. The most haunted house in England? faint whiff of smoked sprats. Bright beam of searing light! Mr Price’s planchette anomalously ignites! 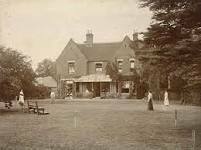 Borley Rectory in Edwardian times – note the complete absence of ghostly figures. 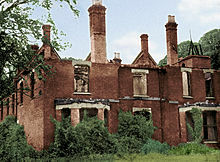 The gutted rectory following an unsuspicious fire in 1939. 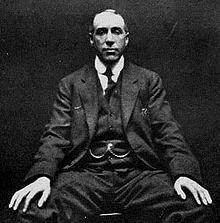 Harry Price, psychic investigator, hoaxer, and alleged sexual predator – note the oversized hands. I’d shared a flat with a ghost cat, but never tried to contact ‘the other side’. Then 26 sent me to the Rectory. It burnt down in unsuspicious circumstances in 1939 – so no actual visit. Instead, Street View clicks past a row of nondescript semis in semi-rural Essex. Nothing spooky, except a kid with a pixellated face, frozen forever on a blurry B-road. Then Wikipedia. Where I encountered self-promoting psychic Harry Price, and Miss Helen Granville, a spinster of no fixed age who held ‘a planchette seance’ on Saturday 12th March 1938, during which Price contacted several of Borley’s spirit residents, including a headless nun. On the very same day, the Nazis invaded Austria. The haunting was a hoax, of course, perpetrated by Price, perpetuated by his gullible followers. The evil forces converging on Austria were all too real. Suddenly, my sestude flowed like ectoplasm. Summoning shades of Madame Arcaty, M R James and Sarah Walters, the phantasm of Helen Granville spirit-gifted me a persona poem, heavy with paranormal and parasexual possibilities. Her overblown verse provided a suitably melodramatic voiceover to my recurring dreams of Price’s interfering hands. Upon waking, I simply wrote it all down.